The Shard Sling MKII is Lenfald's newest, and deadliest, battlefield weapon. Capable of easy transport, the shard sling is capable of devastating cavalry and infantry alike, as well as being ideally suited to taking down enemy beasts and defending castles. Its one failing is in siege work, where the Shard Sling is virtually useless, being incapable of punching through stone walls. First designed by Arfondo Desolta during the Rebellion of Roawia, the original Shard Slings were slow to reload, and the ammunition, jagged shards of metal, were simply poured into the chamber, and propelled outward in a scattered spray. After the war, Arfondo's chief apprentice, (Arfondo himself had been killed during the war), Darle Walson, set about improving upon his mentor's design, fixing many of the problems that had shown themselves during combat, taking extensive feedback from the crews that operated them. The most major changes were the incorporation of a spring-assisted cocking system, more mobile carriage, and the development of more advanced ammunition. Where previously the loader had had to wear steel mesh gloves, in order to load the loose metal, that was no longer the case, as the metal shards were contained within a specially-designed cylinder made of canvas stretched over a basalwood framework. When fired, the canvas and basalwood would disintegrate, releasing the metal shards. Once numbering only in ones and twos, there are now eight official Shard Sling batteries, four of which are stationed in Stonewald. Crewed by three, a loader, a captain/gunner, and an armer/caisson driver, Shard Slings operate in batteries of six, with one battery captain overseeing all six pieces. Each artillery unit is made up of two of these batteries. This scene depicts part of Battery Alpha, of the 2nd Lenfald Artillery, (attached to the Province of Carenval), conducting training operations near the Wandering Woods. For the wildcard entry, do we put the digital banner of the Faction we are building under? And do we repost that in our faction thread for points there? The Swords of Daren - mercenary company led by Sir Daren. Being unable to command his own force during the uneasy peacetime, Daren put together a company who would face any threat. Daren's reputation as a capable leader and his skill with a sword convinced a handful of soldiers and militia men to follow his banner. Through his own command defending the homefront during the Assault on Maldrake, Daren gathered loyal followers among the defense garrisons. But it was through his friends that he gained most of his company. Godwin, a veteran soldier who even participated in the cleansing of the Magic Isles, had known Daren from a young age, and upon his return was so impressed with Daren that he willingly chose to follow him, and through his influence many others followed suite. Daren's cousin Horace who fought alongside the heavy infantry in Lenfeld's armies is responsible for bringing several Lenfeld Heavy infantry to Daren's side, along with his skills with a mace. Toberth Darkstride, known as Tobe to his friends, comes with a shady past, but is loyal and gives his more realistic view (and experience) of the world to offset Daren's noble view of the world. He and along with Horace and Godwin make up Daren's command circle. Following his own personal honor code, Daren wanted a force that would be loyal to Lenfeld, and honorable in deed as well as war; so while his men look alike to average Lenfeld infantry, his force is independent and more powerful. Under Daren's hand, his small force trained so as to become a powerful unit on the battlefield. His men are capable in fighting with glaive and non reach weapons and many of his men are skilled crossbowmen. Between jobs, Daren continues to train his men to fight as a cohesive unit in a variety of circumstances. 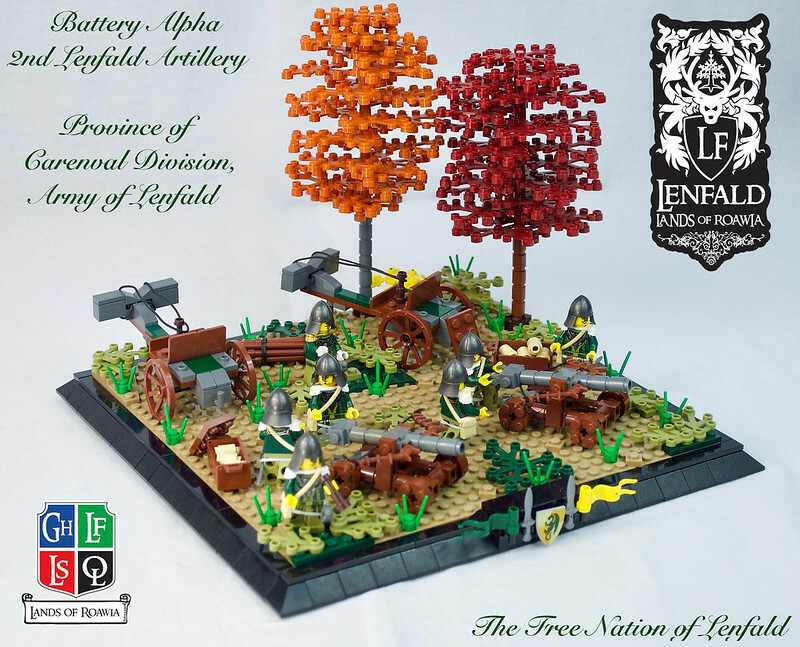 Though currently still untested, Daren's men have confidence in their young leader and are eager to prove themselves as another force for the Nation of Lenfeld! 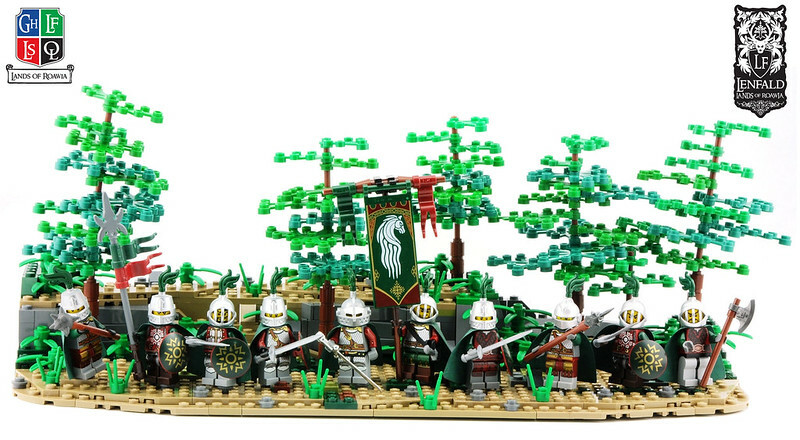 I wanted to post my character's military force; While not the most unique minifigs out there, I am personally happy to have this many Lenfel troops, and I wanted a Lenfeld force that could be a bit more independent of the main army if necessary for character story line, while still being very mainline military. And who knows, as the mercenary company's funds (and my Bricklink budget) increase, the company may in the future change appearance. But here is my entry for the GC! EDIT: actually if you like you could probably post it in the faction you are building for's thread as courtesy if you like... up to you guys how you want to play it. Just be sure to let your faction leaders know so they can add to your personal score. I check this thread and update the index on the first page, so I'll be sure to add Lenfel points from here as well as our thread. Too Easy! So, still no one has answered if the bignette had the restriction of 16x16 max, or it has to be precisely 16x16, but I'm assuming, based off entries so far, that the former is true? It was not my question originally btw. Thank you KVB, I had passed that over since I was thinking it would have been Ayrlego . Nobody listens to me anymore, haha. Known as the Lenfald Elite Forerunner Troop, or LEFT as the scribes like to abbreviate it, this is a group of the top athletes in Lenfald. They are drawn from all walks of life and new members are chosen every year as needed following a week of varied games held near Stonewald on the shores of Everlyn's Tears Lake. Many consider the Forerunners, or Harbingers as they refer to themselves, to be loose arrows who are just asking to be killed. For this reason parents discourage their over eager offspring from considering a career as one of Adrian Windsprinter's trouble hunters. Most of the Harbingers are in fact adrenaline junkies with a great love for the hunt and unlimited patience and self control. Those traits may not seem to go together, but in this case they work wonderfully well. 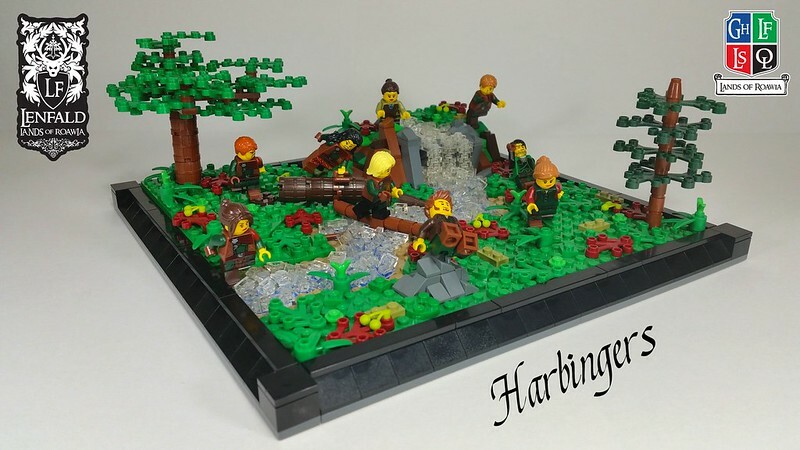 The Harbingers are led by one Adrian Windsprinter from Dragonsmouth. He goes by the title Lead Forerunner and under him there are Primary, Secondary, and Tertiary Forerunners. Everyone else is simply called Forerunner. Forerunners are Lenfald's primary military scouts who concentrate on finding out what the enemy is doing and reporting it as quickly as possible. They work closely with the Scout Snipers and there is a standing wager on who can sneak closest to the enemy position and get the most detailed information. Unlike the Scout Snipers, Forerunners do not carry weapons. Many Forerunners carry small knives, but they rely on stealth and speed for their protection. Sometimes Harbingers will be used as a distraction to lure an enemy force into chasing them. They are expert at staying just far enough away to not get hit, but too close to ignore. It's quite possible I use them again in my story, as I really like them, hope you like it too. 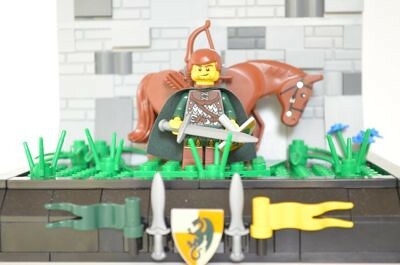 The now famous Bloody Company started as a company of typical Lenfel cavalry, raised by a minor Lord as a cavalry scout force, to serve Lenfald in a now long forgotten conflict. 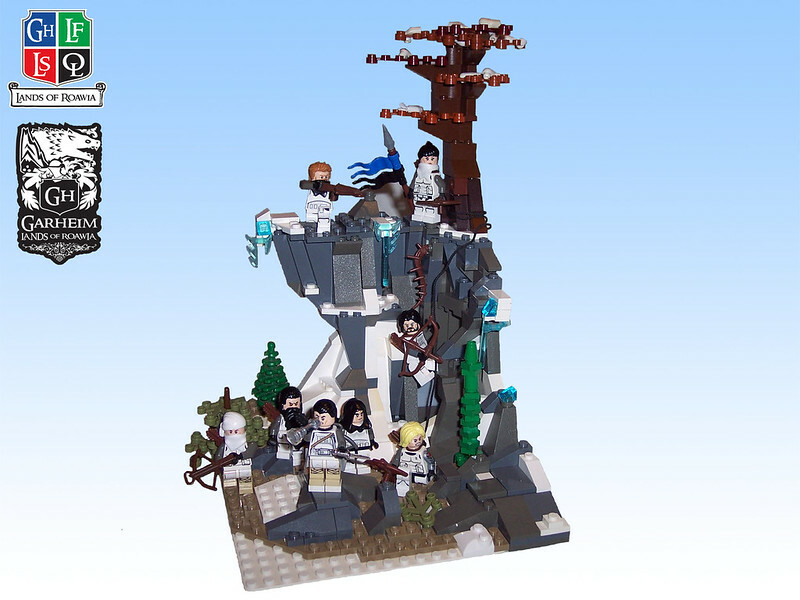 During this conflict, the company found themselves deployed forward from the main Lenfel army, scouting the vastly superior enemy force and reporting its disposition back to command. When the enemy unexpectedly turned towards the city of Isil Oro, flooding rivers prevented the main Lenfel force redeploying to block them. The main army would need to march a long, indirect route to find a viable ford, a route which would prevent them arriving in time to save the city from great slaughter. Thus the Bloody Company, still scouting the enemy army, became the only body of troops between Isil Oro and the enemy army. However, to reach the city, the enemy would also need to cross a river, also swollen by the recent flooding. The only viable crossing point a stone bridge. If they could be delayed here, there was a possibility the main army could arrive in time to save the city. Rather than leave the city to her fate, the commander of the company went to his men, and in true Lenfel democratic style, they voted to defend the bridge. Thus the 30 man company dismounted, and prepared to hold the strategically vital bridge for long enough for the main army to arrive. To this day the company still exists, no longer scouts, they now are a hand-picked band of elite warriors who dismount to fight on foot. They are renowned for their unyielding defence and for flying a green and crimson banner in place of the normal green and yellow. Over time the crimson has also been adapted into their armour and clothing creating a distinctive group of warriors whose presence in a Lenfel army inspires great hope amongst friends and great despair amongst enemies. Should entries for the Cream of the Crop be all one type of soldier, or could an entry include multiple types if they are associated in some logical fashion? To be more specific, I have units of archers, pikemen, and light infantry, all of whom are part of the same army, but have quite different uniforms. Should I include all of them, or should I just pick one unit? 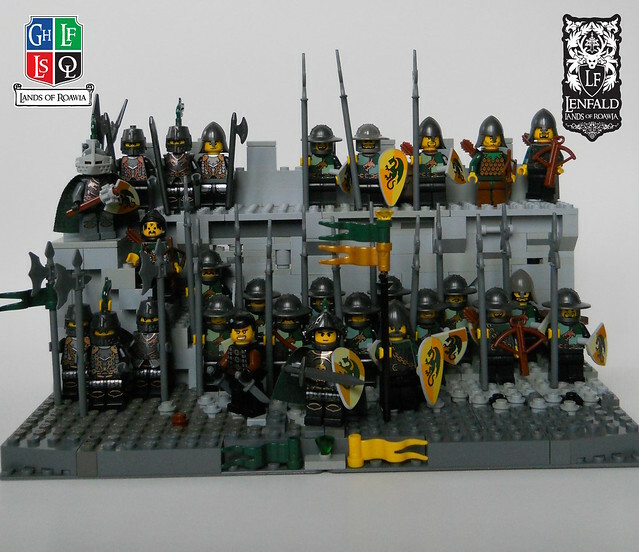 The realm of Orevale Hold is protected by its sovereign warriors: the Valeguard. Of these hardy northmen, a handful of elite soldiers and rangers are selected from among their ranks and inducted into the special forces unit Wulfguard. Lightly outfitted in wool-lined chainmail and tunics stark white as the winter's snow, the Wulfguard Trackers are the elite of the elite, moving quickly across the snowy crags and icy plains of Garheim in their protection of the land, sent to places even the mighty Dire Wolves the Wulfguard employs cannot easily tread. Known for their tenacity in tracking prey - be it man or beast - it is said that no man can evade the Wulfguard for long. Totally up to you! If they tie together in some way that would be great, like a cavalry unit with supporting pikemen and archers? Their is certainly no requirement for them to be all one type of soldier. Nope, the mountain is great!